Designers, we hope you enjoyed your first week of seminars during Week 3! Week 4 updates, announcements and reminders below. There is no school Monday 9/3 for the Labor Day holiday, and no classes in session on Friday 9/7 due to a professional development day. Students will be able to learn about the club offerings available to them this year and sign up during this extended advisory period. 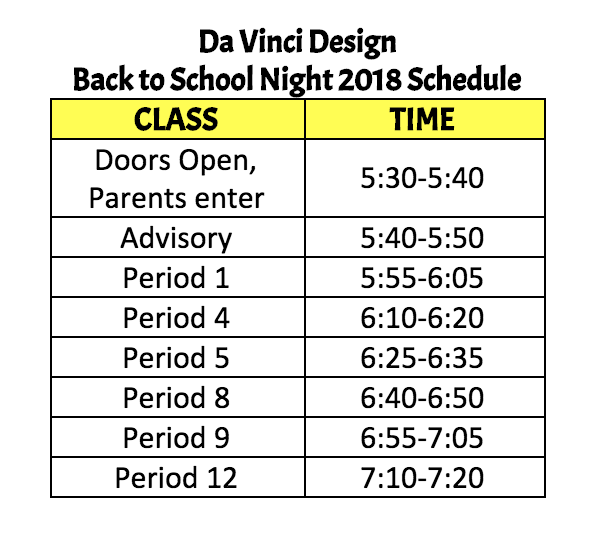 Students, parents and teachers: Would you like to be part of Da Vinci Design’s School Site Council? If you would like to nominate someone, or nominate yourself, for a seat on the Da Vinci Design School Site Council, we have more open slots this year! The council meets 4 times a year to discuss, vote on, and provide feedback on various school programs and topics. We are looking for parent and student nominees. If you are interested in being nominated for the council or would like to nominate another individual, please fill out this FORM by Friday, September 7th. Voting for the council will take place via an online survey posted to the blog later the following week and new members will be announced once voting has closed.